Are you a walking, talking, even breathing human being? Your doctor probably mentioned it. Your childbirth class likely brought it up. Even the “get ready for baby” books everyone’s given you have a chapter on the subject of Baby Blues and PPD. You know that you’ll have a dip in hormones after your sweet pooping miracle arrives, and that you’ll most likely feel down in the dumps for a few weeks. You’ve heard that you might not bond with your new baby right away, and that is A-OK. You’ll get there, but it might take a few weeks/months. You’re aware that if it gets so bad that you think about hurting the baby or yourself, this doesn’t mean you’re a sociopath, it means you should consult your OB. All these things don’t necessarily make the hormonal rodeo itself is any easier, but at least it’s not a totally foreign concept. So, since you know so much about these risks (great job, by the way!) then I’m sure you know all about Postpartum Anxiety… right? Well, don’t feel too bad. After my son was born last year, I definitely experienced some of the classic symptoms of the Baby Blues: general weepiness, moodiness, and a sense of hopelessness lasting for less than a month after giving birth. Ok, Baby Blues, big check mark. This wasn’t too surprising, since the Baby Blues hits around 70% of all new mothers. Here’s the thing, though; I’ve always been much more prone to anxiety than I have been to depression. Despite this knowledge, it absolutely shocked me when my predominant feelings after giving birth were those of anxiety. This anxiety felt worse than usual, though. I can remember sitting on my couch and being absolutely overwhelmed with a general sense that something terrible was going to happen and there was nothing I could do about it. I would look at every hazard in my house (which is like, you know, EVERYTHING) and picture my baby somehow being maimed. I was scared to be alone with him, but I was also afraid to leave his side. Talk about conflicted emotions! Well, it turns out Postpartum Anxiety actually IS a thing, and that some studies say it is even more common than PPD. So common, in fact, that about 17% of all women say they experience the symptoms of an Anxiety Disorder after giving birth. Did you know that after giving birth, your new maternal mind can bring on a whole host of new psychological “surprises” for you and your doctor to work through? They mean well, but it can translate into an indication that you should be having the time of your life. Except you’re not. Because you’re a giant ball of anxiety. The truth is, even though it’s normal to feel overwhelmed and a little scared with a new baby, you should still do a gut-check every now and then. Do you have a feeling that something is wrong? Like really wrong? Are you thinking and feeling things that you know aren’t normal for pre-partum you? Remember, the biggest definer in identifying Postpartum Anxiety is duration. If your symptoms last for two weeks or more, talk to your doctor. Disturbed sleep or eating: Ok ok, everyone with a newborn should check this one! But, when you finally have time to sleep, are you unable to because you’re so worried? Feeling restless or “on edge” all the time. A compulsive need to “check” things in the house. You might even develop routines to calm yourself down, like locking all of the doors multiple times a day. A sense of dread that something terrible is about to happen. Physical signs such as nausea, headaches, or muscle tension. Feeling afraid that you’ll never be “normal” again. Feeling scared to tell family or friends because your baby might be taken away. The team here at Mighty Moms has come up with this beautifully designed printable with these symptoms. Download it here, print it out, and either stick it on the fridge, or tuck it into a private drawer to give you a quick resource when you’re not doing so hot. You’ve read through the list above, and several of those checked off some mental boxes in your mind, as possible uh-oh’s. Your first simple step to addressing Postpartum Anxiety is to tell your Obstetrician (OB) . Even if you’re finished with your 6-week postpartum check up, give her a call. These symptoms can sometimes take several months to fully surface! Depending on your situation, the doctor may recommend a therapist, medication, or a combination of both. Getting help with mental struggles doesn’t make you weak, it makes you smart. Your second step is to talk to your spouse, close friends, or a loving relative. I noticed that my anxiety battles got better fairly quickly once I starting sharing that they existed. (Well, by “got better” I mean, “returned to their normal level of crazy”.) I found it was really helpful to verify with friends that I was not, in fact, losing my mind. It was profoundly comforting to realize that there was a biological cause behind the emotional effect I was feeling. It wasn’t a “mind over matter” kind of struggle, it was something that required outside intervention. If you’re having trouble putting your thoughts to words (or aren’t quite ready to talk to another human being) give journaling a try. Put pen to paper and write how you feel without pre-judgment or filtering. Treat yo’self to a beautiful leather journal like this one and get started. The third step is to take advantage of a few excellent resources and educate yourself! Check out the book Beyond the Blues. 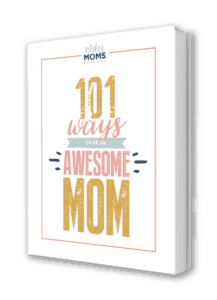 It’s a readable, basic resource for struggling mommas. If you’re looking for a personal story, try Supermom: A Postpartum Anxiety Survival Story. It’s always so encouraging to read about how someone else overcame a similar struggle! Back when Mighty Moms was called Incredible Infant, Heather interviewed Katherine Stone of Postpartum Progress about postpartum mental illness. WOW is it helpful! One of the quotes I especially loved is, “Just because you’re a new mother doesn’t mean you have to be a martyr… you’re a person!” Click here to listen to it now. As I was sharing my Postpartum Anxiety struggles with friends, I was encouraged to hear many of them reply with a hearty “me too”! I think that’s what confused me. If so many other women have struggled with Postpartum Anxiety, why have we not heard more about it? Perhaps it’s because it’s almost a cliché to be a “nervous new mom”. Perhaps we assume that this is part of the parenting deal, that our worrying is a notch in our maternal belt. That by having this anxiety, we are proving to ourselves (and perhaps to others) that we have officially “become a mother”. Whatever the reason, I’m throwing down the gauntlet! It’s time to push this to the front of the public’s eye. To throw the dusty curtain off and reveal what’s hiding underneath. One of the most discouraging parts of new motherhood is the feeling that your life is going to be difficult and out of control forever. Amidst the sea of people telling you to “enjoy this time”, let me be the first to tell you what I so desperately needed to hear, IT GETS BETTER! Holly has been a nanny, missionary, and a therapist, but right now is enjoying focusing on her number one client, her one-year-old son. She enjoys cooking, DIY home projects, listening to NPR, and reading The Little Blue Truck until she goes cross-eyed. Learn more about Holly here.